UNITED NATIONS, January 1 -- As mortar fire rained down in Mogadishu on the palace of the President, who just resigned, in the UN the Security Council resolution for a peacekeeping force which the United States had said was a priority died a quiet death on December 30. At the Council stakeout on New Years Eve, Inner City Press asked outgoing South African Ambassador Dumisani Kumalo what would happen next on Somalia. Ambassador Kumalo expressed disappointment that nothing was done by year's end, when he and South Africa leave the Council. 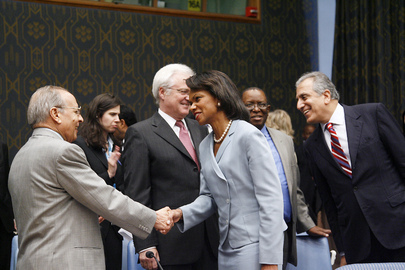 Kumalo was the most vocal Ambassador on the Council for engagement in Somali civilians' two decade-long crucifixion. This was the last question he would answer as a Security Council member, and he vowed to continue to advocate for Somalia even once off the Council. The backstory is that in the run-up to the year-end deadline set by also outgoing U.S. Secretary of State Condoleeza Rice, Security Council members met at the expert level on competing resolution drafts by the U.S. and the United Kingdom. When Ms. Rice came to the UN earlier in the month, she and UK Deputy Permanent Representative Karen Pierce crossed swords on the practicability of a UN Peacekeeping mission in Somalia, with Pierce as the skeptic. While most insiders consulted by Inner City Press had expected the U.S. to push for a vote on its resolution by the end of the year, since its passage would be much less likely with South Africa and Italy leaving the Council, ultimately the U.S. backed down, not wanting an open conflict with the UK. Therefore on December 30 it was said that attempts will be made in the new year to somehow merge the conflicting U.S. and UK drafts. Thus the U.S. which backed the ill-fated Ethiopian incursion into Somalia during the Christmas to New Years period in 2006 ended up further selling out Somali civilians during the same period two years later. On New Years Eve in front of the Council, outgoing U.S. Ambassador Zalmay Khalilzad did not mention Somalia, only Gaza. The same was done by UK Ambassador John Sawers: Gaza only. Afterwards, Inner City Press tried to get Africa answers but was told that its coverage is too negative. But what about the impacts in Somalia? This will be pursued in the new year.